Handcrafted to exacting standards, Kollàge's square knitting needles are designed to be ergonomically suited to your hands, decreasing stress and strain for those who love to knit. They enable you to knit faster with more uniform stitches. These will be perfect with those slippery yarns so no more dropping stitches. Kollage believe, and have been told by many, the square needles are easier to use by those who have arthritis, carpal tunnel, or stiffness in their hands and fingers. You've got to try them! Here at Yarn Box we're taking them for a test knit and will let you know our thoughts, but why not try them for yourself? Available in circular or DPNs. 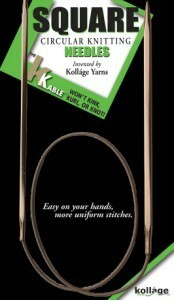 Kollage Square Circular Needles 32"